Hey everyone! Today is Tuesday which means it's Midnight Madness time! This card is for the Midnight Madness sketch and this week's color challenge at SCS. The colors today are Kraft, So Saffron, Night of Navy. 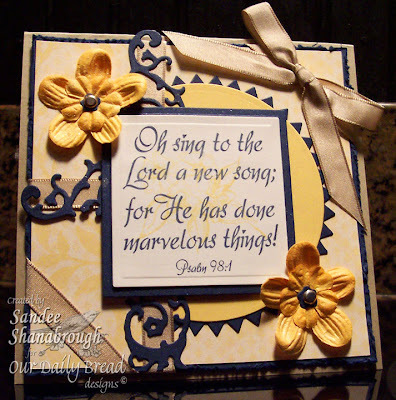 The stamps I used for this card belong to a beautiful set from Our Daily Bread designs called Sing to the Lord. I stamped the flower in Saffron and then stamped the sentiment in Navy. I colored the Hero Arts flowers with copic marker Y21 to match the saffron. I used a cuttlebug die to cut the flower swirl and used some of the tiny flowers for the center of the saffron flowers! After getting everything put together, I sprayed it with Glimmer Mist Pearl, but I don't think you can see that too well in the photo. Then I attached it to the Kraft card base. And that's it! I hope you all have had a wonderful day! Thanks for coming by. Go to ODBD's blog in the morning (9:00 am CST) to begin the Blog Hop. There will candy somewhere along the way! Hi everyone! Today is Featured Stamper Day at SCS and today we are enjoying the beautiful gallery of DawnL! She is an amazing stamper and has some great stuff in that gallery! I chose to case this wonderful tag she made! I made mine a card instead of a tag. I was really inspired by the flower soft design and wanted to emulate that, but... I think I need a Flower Soft lesson! I remember reading that a little goes a long way. Well, I added it around the oval and thought, wonder what it would look like if I added it here? MISTAKE! So then I tried to fix it. MISTAKE! And so I just added it everywhere and it is what it is!!! LOL! Underneath all that flower soft is an embossed nestie oval. I used an Old Olive marker to draw inside the embossed indention, and used a ruler to draw a square around the oval to look more like Dawn's tag. You just can't see it for all the flower soft! Well, anyway, this is a sneak peek at new stamps being released on July 1st from Our Daily Bread designs, called Mother Teresa! Be sure to go to ODBD's blog on the first to join in some blog hop fun! Reminder to check out ODBD's Weekly Sale! How about a Super Shimmery Special Sale for this week? This week we're offering all Shimmerz for 25% off and you're not going to want to miss out on this one! If you've seen and heard about how much sparkle and shimmer they add to your stamped images then you'll want to take advantage of our sale and grab some up. We have 50 fantastic original and Blingz colors to choose from that will quench your Shimmerz thirst! You have one week to get your list together and order.....until Friday, July 3, 3009 at 12 midnight! NOTE: Sale prices will be reflected in your shopping cart. and thanks for visiting with me today! I am up way too late! But I really was inspired by the inspiration challenge for today! The challenge today is the artwork by Sarah Collier. I chose this piece to use as my inspiration. I stamped the image onto vanilla cardstock. I masked off the circle and the left side to sponge Bashful Blue. While still masking, I sponged the right side with Barely Banana. Then I sponged the circle with Creamy Caramel. 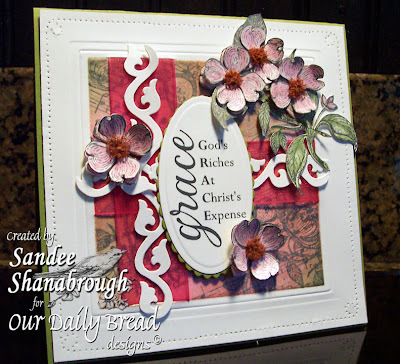 The sentiment from Our Daily Bread designs, Flourished Christian Symbols, is stamped with Memento Brown. I then covered the design with a piece of clear window sheet, attached at the top with brads. I tied a pretty piece of yellow ribbon to hold the bottom together and then attached the whole thing to a Bashful Blue base card. I have no idea who makes the bird image. I bought it at a rubber stamp show and it is unmounted rubber. Thanks again for stopping by! Sleep tight! 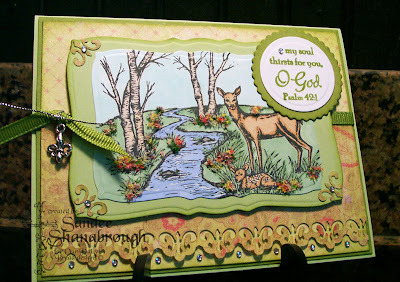 Here is another sneak peek of one of the amazing new stamp sets being released On July 1st by Our Daily Bread designs! This set is called Let Us Begin and is part of the Mother Teresa collection. I inked up the stamps with Versamark, and gold ink and then heat embossed with gold embossing powder. I layered this with Pink Pirouette and Prism Gold Metallic paper. I used a Classic Square die for the white and the Labels Three die for the gold layer. The pretty lotus corner is water-colored with ODBD's Vintage Pink inkpad. I smooshed the lid into the inkpad in order to get the ink onto the watercolor brush. I pierced a couple of holes to thread the gold cord through to attach the gold cross charm. I added a tiny gold half bead to the charm as well! 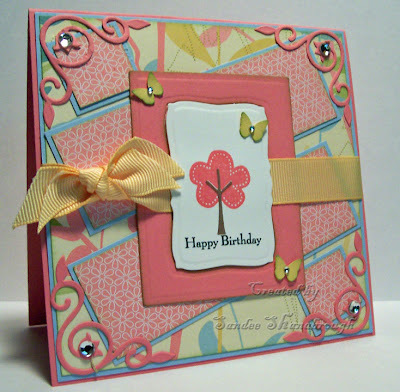 The base of the card is Pink Pirouette, layered with gold and then layered with a piece of Bella Rose designer paper(SU!) 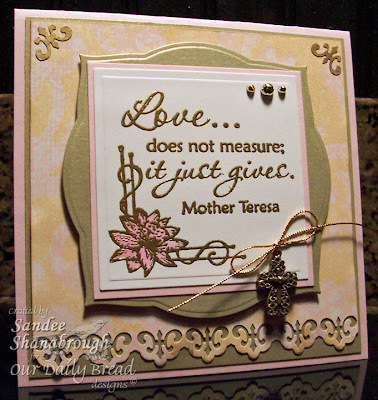 On the dsp, I used Tattered Angels Gold Glimmer Mist with Glimmer Screens Decorative Corners. I used an EK Success border punch at the bottom and used two of the punched Fleur de Lis pieces in the top corners. I inked them with gold ink before attaching them! I added three more gold half beads to finish the card! The Dirty Dozen theme this month is all about beginnings. If you are a SCS Fan Club Member you can check out this month's Dirty Dozen stuff here. I chose to make a wedding card for this month's Central Theme challenge. Thanks for coming by for a visit! The Limited Supplies Challenge today on SCS was pretty timely in that I needed to make another masculine birthday card! However, as I am uploading I realize that I didn't follow the rules very well! We were to choose one thing from three lists. And the card needed to be a 'man' card! I did ok with the first two lists, but with the last list I think the ovals and the punched sentiment along with the brads and ribbon, disqualifies me! Oh well, I still need the 'man' card! This textured designer paper is perfect for masculine cards! I sponged it around the edges. I inked up the image with Versamark and then Memento brown before stamping and then heat embossed with clear embossing powder. Then I sponged with Creamy Caramel, Sage Shadow, and Always Artichoke inks. I do like how this turned out even though I failed the challenge! Thanks for your visit! Have a wonderful day! Masculine cards are so hard for me to create! I know I am not alone! Hahaha! I've been looking for designer paper with an old map, when I didn't need it, it was everywhere! Today I found this sheet in a scrap-booking kit from the Paper Studio called Destinations. It's not exactly what I had in mind but it will do. I sponged it heavily around the edges which helped a lot! The image panel and two little rectangles behind it are the other side of the map. 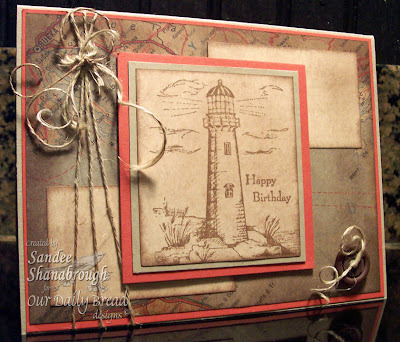 The light house image is from a set called Light of the World from Our Daily Bread designs. I used my Stamp-a-ma-jig to break up the birthday sentiment, which is from SU! 's set called Very Versatile. I added a button and linen thread to finish the card! What do you think? I'm glad you came by tonight! Please visit again soon! Our Daily Bread designs has a Super Sunday Special! Sneak Peek, Midnight Madness, and A Big Announcement! You all are going to love the new sets being released on July 1st by Our Daily Bread designs! Gorgeous I tell ya! This sneak peek focuses on the Amazing Grace collection! For my card today, I used the Midnight Madness sketch for this week. The base card is Old Olive. Then, I used a Spellbinder Square Nestabilities die to emboss my frame in the center of the white layer. I masked off the center of the square with sticky notes, so that I could create the 'designer paper'. To create the 'designer paper', I stamped the Hymn and the dogwood flowers in black. Then I sponged three colors of ink trying to use mostly pink. Then, I sprayed it with Glimmer Mist Pearl! I removed the mask, cut slits with my ex-acto knife to attach some pink organdy from my ever-growing stash and added the cuttlebug die cut vines over the ribbon. Then, I stamped, sponged, cut and glimmered the flowers. Whew! That took forever! I attached extra flowers to give dimension and then added brown flower soft to the flower centers! I used an Ornare piercing template to pierce the border of the card! I love, love, love this collection of stamps! Within the next few days, I'll be posting another sneak peek using one or both of the new releases, so stay tuned! WOW! I have to pinch myself all the time! I told someone not too long ago, that I am in awe to be working with all of these famous stampers! I am just tickled to death! Well, thank you so much for coming by today! Hope you all have a blessed day!!! Good morning!!!! 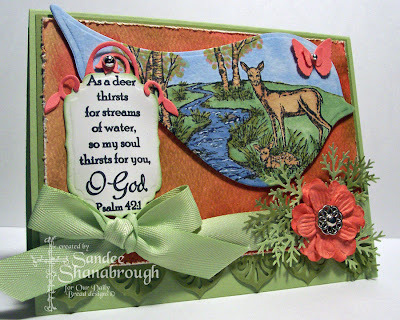 Here is another card I made using Our Daily Bread designs new set called Quiet Waters. 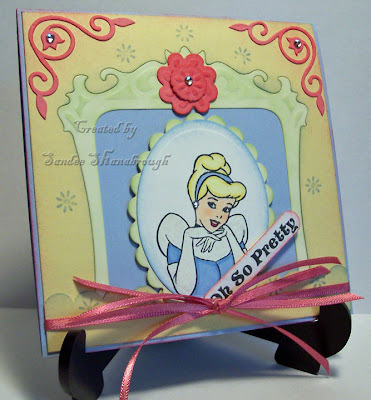 I was inspired by this week's Featured Stamper, Christy S, with her card here! I loved how she had the patterned paper sectioned off into three panels. I used Making Memories paper and matching buttons and a pretty black flower I found! I stamped the scene onto a piece of Going Gray paper, and then stamped the sentiment over it in black ink. Then, after cutting out the oval, I sprayed it with Glimmer Mist Pearl! Now, the black was not as dry as it should have been so it smeared slightly! But I kind of like the effect! It's funny how accidents sometimes turn out ok! Then I added the corners and black rhinestones to finish the card! ALL Prism cardstocks at 25% off! Sale ends June 28 at 12:00 AM EST. I hope you have a fantastic day and thanks for visiting! I received a 'Lovely' award today from a sweet lady by the name of Sue! Thank you so much Sue! I am so excited and I appreciate this so much! If you are not familiar with Sue, here is a link to her 'Lovely' blog! 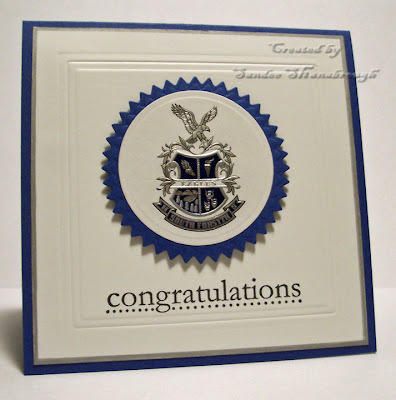 Accept the award, post it on your blog together with the name of the person who has granted the award, and his or her blog link. 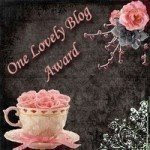 Pass the award to 6 other blogs that you’ve newly discovered. Remember to contact the bloggers to let them know they have been chosen for this award. If you can’t pass it on to 6 just pass it on to as many or as few as you like! I love visiting these ladies blogs and I know you will too! Have a great night and thanks for stopping by! My hubby and I will celebrate our 30 year anniversary on Monday! I made this card for him this morning using the Inspiration challenge today, Bugaloo baby shoes. I chose these adorable little shoes for my inspiration. 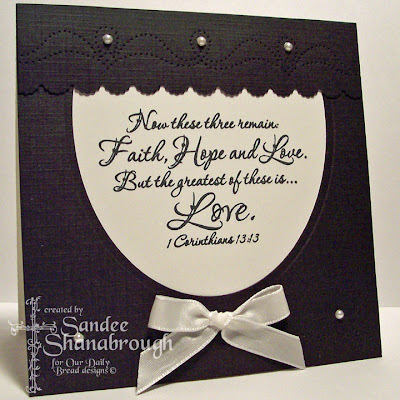 Of course I used this wonderful scripture stamp from Our Daily Bread designs from their Love set! 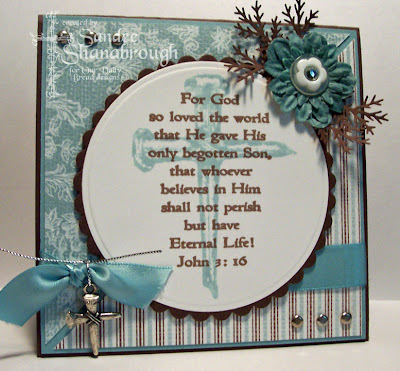 I used an oval Spellbinders nestie to cut the black frame for the scripture. I used an EK Success border punch to create the scallops on the top piece. I also used an Ornare piercing template to pierce the top piece and the bottom corners which is hard to see on the picture. I added Hero Arts pearls and pretty white ribbon to complete the card! Thank you so much for stopping by today! Have a wonderful day! Punch-A-Bunch Frenzy going on right now! All punches in the store are on sale at 25% off and it ends on Sunday, June 21 at 12:00 AM EST so hurry! Sale price will be reflected in your shopping cart. I love this color combo! Today's combo is Ruby Red, Baja Breeze and Whisper White. I combined the combo with the Midnight Madness 06 sketch today! 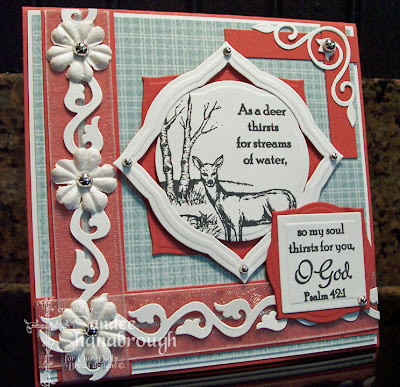 I used one of June's new releases by Our Daily Bread designs called Quiet Waters. I stamped the image and sentiment with Memento black ink and I masked the sentiment to split it up. I decided not to color the image for this card but sort of wish I had now. I used my cuttlebug to cut the corner, vines and all the nestie squares. Added the primas and silver embellishments to complete the card! What would I do without my little 'bug'?! Thanks for stopping by! I appreciate your visits! Have a magnificent day! Ok, I am way behind with the Christmas Card challenge this year! I made 10 of these for March last night! I struggle with Clean and Simple cards but when I saw Jen's challenge for this week, I knew immediately what I wanted to do! The only extra thing I did was add stickles! How easy is that? Thanks for looking! 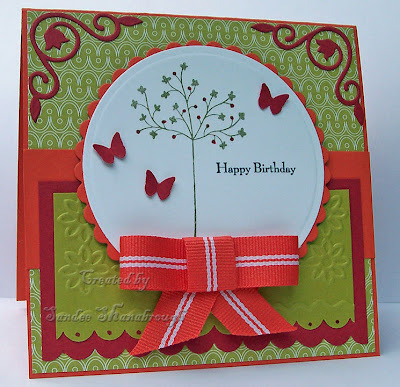 Today's featured stamper on SCS is Sumtoy! She has a fabulous gallery! I chose this card to case. I really like her layout and the border at the bottom. 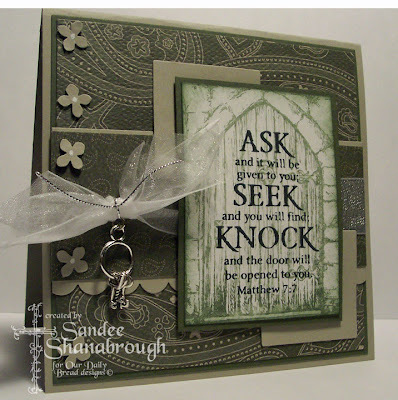 I chose a different ODBD stamp set, one that is new this month called Ask, Seek, Knock. I stamped the door onto Manchester designer paper, punched the border at the bottom with an EK Success punch. I layered that onto a piece of Baja Breeze which is then layered onto Chocolate Chip and added to the Kraft card base. I did the sentiment differently too by stamping it and cutting layers out with Nestablilities dies. Added the bow and corner treatment to finish the card! Hope you have a wonderful week and thank you for taking a look at my card today! I can't seem to put down these gorgeous sets from Our Daily Bread designs! 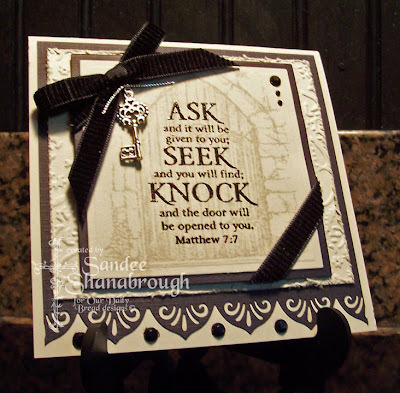 Here is another one using one of this month's new sets called Ask, Seek, Knock. I used this week's sketch challenge on SCS for the layout. The base is Sahara Sand paired with, Always Artichoke cardstock and textured designer paper. I stamped the door with Always Artichoke ink, stamping off once. I stamped the sentiment over the door with Memento Black ink, then sponged around the edges with the Always Artichoke. The little flowers are done with a Martha punch and a little dot of white in the centers. I found the little set of keys in the charm section at Hobby Lobby! So fun with the stamp set! Thanks for looking! Thank you Lord for this gorgeous day! Good morning! I just finished this card for the Midnight Madness sketch today! I used some of SU! 's textured paper. I stamped this beautiful cross from the He is Risen! 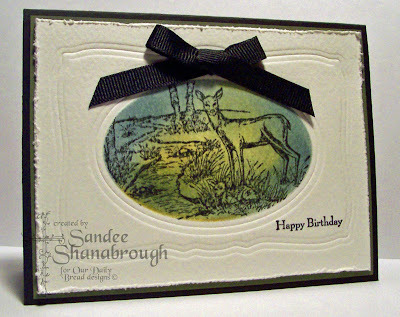 set from Our Daily Bread designs with Soft Sky re-inker (just scribbled the re-inker onto an acrylic block and tapped the stamp into the ink! ), then overstamped the sentiment with Memento Brown. I colored the flowers with copic marker BG72 and added the button. There is a little bling added to the button too! The cross charm I found at Hobby Lobby is a perfect match to this wonderfully inspiring stamp set! Thank you for visiting me today! Hope your day is full of wonderful things! OH MY GOSH! I got another award ya'll! This one is from the Midnight Madness sketches over on Priscilla's blog! Thank you all so much! I am tickled to death! If you haven't joined in the sketch fun over there, give it a try! Hope you all have a great day! I have been putting off making this card because I just could not figure out what I wanted to do. I almost bought a card just to have it done! And then it hit me! I cut apart the invitation and die cut the circle around the coat of arms with a nestie circle. Added the zig-zag circle, and embossed a square nestie to frame it. I used a ruler to carefully edge the white layer with a matallic silver pen. Then I used the Stamp-a-ma-jig to place the sentiment. How's that for recycling?!!! Thanks again for taking a moment to check it out! Have a great week! The kid's rooms in this weekend's inspiration challenge are so cute! I chose this photo for my inspiration. Recently, I found a set of clear stamp images of Disney princesses and thought this would be perfect for this challenge! I colored her with copics and a white gel pen. I did lots of sponging and added some bling even on her earlobe! Thanks for visiting this afternoon! Today's Featured Stamper on Splitcoast is Kisamari! I chose to case her adorable Snowy Jo! 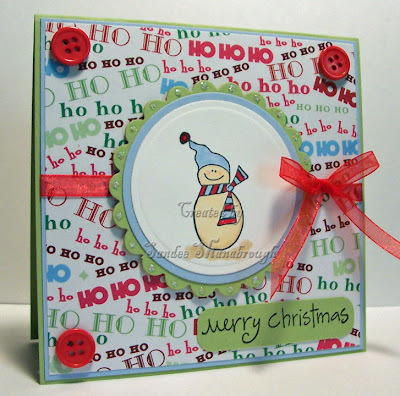 I kept the snowman theme but used a different stamp, changed the colors, added fewer buttons, extra layers and did the ribbon differently! I also added stickles to the scallops. Thanks for the wonderful inspirations to choose from Kisa! Good morning! 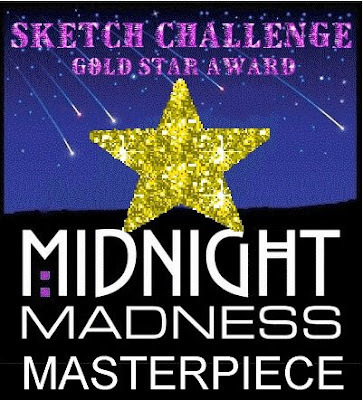 This is for the Midnight Madness sketch this week MMSC4! Quite an interesting sketch to work with! The designer paper is SU! 's Walk in the Park paper, both sides of the same sheet. I cut the frame with nestabilities dies and then the white section is cut again and popped up. Had to use my Stamp-a-ma-jig to line up the little trendy tree and sentiment. I sponged the butterflies and around some of the edges with Certainly Celery. And then, of course, had to add a little bling! Thanks for visiting with me today! Happy Friday night everyone! The last few days have been crazy for me but I did manage to create a couple of cards this week to share! I struggle with masculine cards! But this may be the easiest one I have ever made! 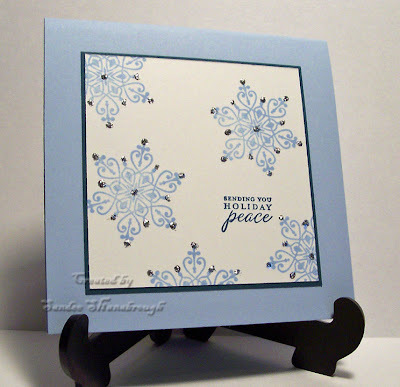 I love the deep embossing you get from the Spellbinders nesties! The dies I used are Petite Ovals Small and Curved Rectangles. 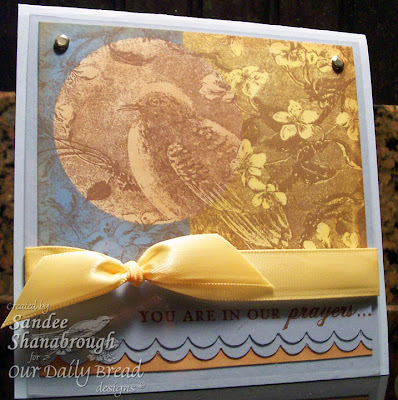 I masked the oval to stamp this beautiful image from Our Daily Bread designs called Quiet Waters. Then I sponged Bordering Blue, Always Artichoke, and So Saffron. I distressed the edges, added a sentiment (SU! Very Versatile) and ribbon to finish the card. Quick and easy! I was going for 'artsy' on this next card! Did I succeed?! 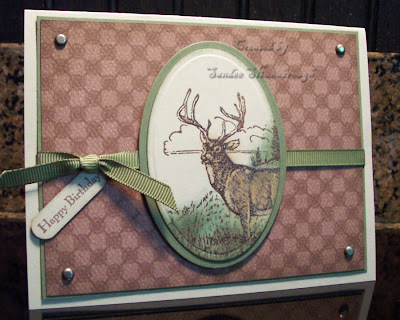 After stamping the deer scene onto watercolor paper, I used the Nested Bird die from Spellbinders to cut it out. Then I colored it with copic markers(B21,B34,B39,E31,E33,E51,G21,R22,YG95,W5). I highlighted the fawn and the stream with a white gel pen too! The background is another piece of watercolor paper inked with reinkers and a baby wipe! The edges are distressed. I cut out the scripture with a Labels Four die and sponged the edges. I colored the flowers with a copic marker too! (R22) The scripture has two layers of foam tape in the center and one on the edges to give it that curved look. Well, what do you think? Have a great weekend and thanks so much for taking a look! Good morning! I made this for yesterday's color challenge. Tango Tangerine is not one of my faves, I have to say. But I do like it with the kiwi and the red. A friend of mine gave me some leftover snippets of tangerine ribbon a while back and knew I would eventually use them so I made the little bow with those little snippets! I cuttlebugged the kiwi layer and used the scallop punch for the kiwi and red layers. I stamped the image with Old Olive and colored in the little dots with a copic marker (R29). Added the little butterflies to finish it! Thanks for stopping by today! Hope it's a great day for you! Our Daily Bread June Releases!! Good morning! Well, today is the day! Our Daily Bread designs is releasing two sets! This card is made with Ask, Seek, Knock. 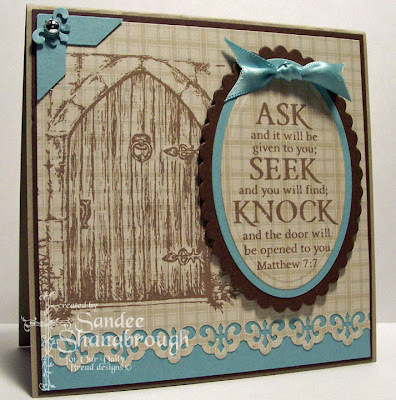 I stamped the door image with Sahara Sand onto Sahara Sand cardstock. Then I used Versamark ink to stamp the sentiment before heat embossing it with black powder. The image is cut out and matted with Spellbinders Nestabilities Squares. Under this, is a layer that is dry embossed with a cuttlebug folder and the edges are distressed. The bottom of the black layer is punched with an EK Success border punch. I added SU! ribbon, tied a key onto the the ribbon with silver cord and added the black rhinestones to complete the card! I love this set! What do you think? Now for the next card.. I used the set called Quiet Waters! Such a peaceful scene! I colored the image with copics (B21, BG10, E31, E33, E51, G21, YG63, W1, W3, W5). I highlighted the fawn's spots and parts of the little stream with a white gel pen. And then I added Flower Soft!!! Fun stuff I tell ya! The image and mat, and the sentiment circles are cut out with more nesties. I colored just a partial sentiment with my Old Olive marker so that it would fit in the cirlce. Under the image, I used two sides of K&Co designer paper. The bottom is punched with an EK Success border punch, and then I sprayed the layer with Gimmer Mist Pearl! I added some of the negative punched pieces to the corners of the image layers. While I was at Hobby Lobby yesterday, I found this little charm which matches the border! Cool! Then I added some more bling to finish! Now check out the cards these ladies have created with these sets! Thanks for visiting with me today!